Today the Landmarks Preservation Commission (LPC) unanimously approved plans for a major expansion to the American Museum of Natural History (AMNH) in New York. In almost 90 pages of presentation materials, representatives from Studio Gang, preservation consultants Higgins Quasebarth & Partners, and landscape architects Reed Hilderbrand demonstrated to the commission and the public how they would demolish three museum buildings constructed between 1874 and 1935 to make way for the Richard Gilder Center for Science, Education, and Innovation. In a radical but elegant departure from AMNH's mélange of Victorian gothic, Beaux Arts, Richardson Romanesque, and contemporary buildings, the 195,000-square-foot Gilder Center, inside and out, takes formal cues from geological strata, glacier-gouged caves, curving canyons, and blocks of glacial ice. "Sleekness was never a goal—we wanted a richness of texture," explained Studio Gang design principal Wes Walker, in a pre-meeting model walkthrough with The Architect's Newspaper (AN). The pink Milford granite the designers intend to use for the facade is the same stone used for Theodore Roosevelt Memorial Hall, the museum's main entrance on Central Park West. The Gilder Center granite will be sliced into two- and three-inch-thick bricks and arranged in diagonal bands on the facade to create the attractive variation that's produced by ornament on the neighboring 19th-century buildings. Bill Higgins (of Higgins Quasebarth) and Jeanne Gang detailed how the unconventional form will fit in with—and enhance—those buildings: The original, aggressively rectilinear master plan calls for architectural focal points on each of the museum's main facades. The angular forms are complemented by a playful, curvilinear landscape—plans show undulating paths that flank the imposing buildings. The rectangle/curve relationship remains at the Teddy Roosevelt entrance, and the Gilder Center, directly across the complex, extends and amplifies historic precedent—"[it's] an insertion into the historic fabric," said Gang. For AMNH, the new building is both an addition and connective tissue that bridges disparate programs. Museum president Ellen Futter explained that her institution needs to expand to accommodate five million annual visitors: Though its classroom and exhibition space will augment the museum's offerings, the Gilder Center is also a switchboard, connecting ten buildings at 30 different points. Inside and out, transparency and accessibility define the design. Vertical glazing on the facade lets visitors see deep into the structure, like looking into a fjord. 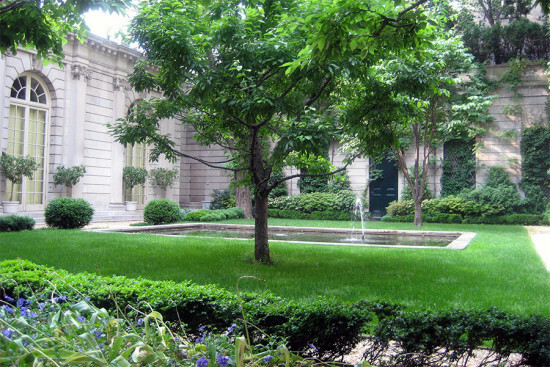 Where the museums of past centuries defined their monumentality with great granite steps, the Gilder Center's no-step entrance allows for seamless access for people with mobility impairments or strollers. The addition will also open up sightlines to Building One, AMNH's first structure, via a passageway and additional gallery space. 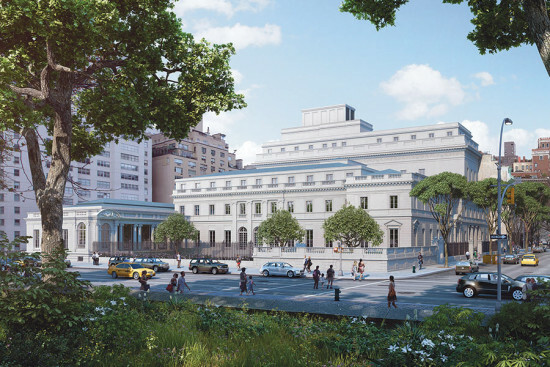 Manhattan borough president Gale Brewer, councilperson Helen Rosenthal's office, AIA New York, the Van Alen Institute, and the Columbus Avenue BID spoke in support of the addition, but preservation and neighborhood parks groups were not as bullish on the project. The Historic Districts Council (HDC), while offering that the Gilder Center "defers sensitively" to existing buildings, questioned the facade detailing and expressed concern about the building's exposed interior. The structural concrete columns that define the main space, HDC claims, are not clad in the same quality material as the facade. The group suggested Studio Gang refine the design further. Residents and members of park preservation groups spoke out against the Gilder Center because it encroaches on Theodore Roosevelt Park, and its construction requires the removal of seven mature trees. In response, Reed Hildebrand divided the layout into slow and fast programs—slow, or passive recreational activity will be directed away from the Gilder Center entrance, a meandering paved walkway shaded by (new) trees and curving flower beds. 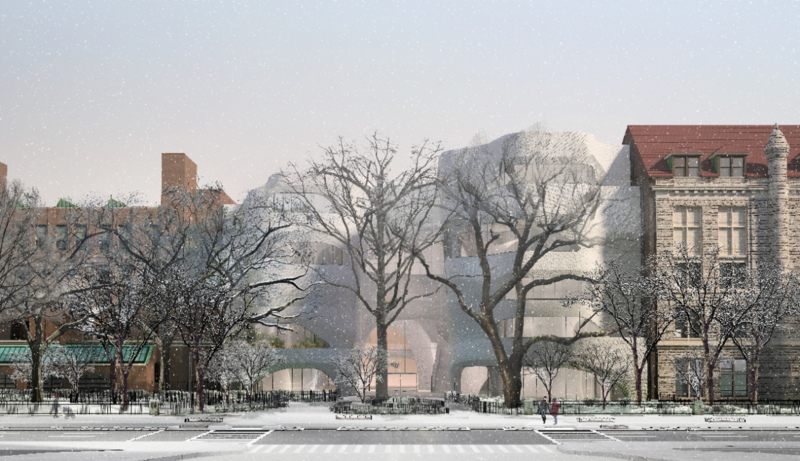 80 percent of the addition will occupy the museum's existing footprint, and less than two percent of the 10-acre park will be sacrificed to AMNH. Noting the designers' willingness to adjust their designs in response to community concerns, the commissioners offered additional suggestions. Chair Meenakshi Srinivasan said that the cultural aspect of the museum was often absent from the conversation around the design, while other members suggested that the architects reconsider the stucco planned for a northern exterior wall. Commissioner Frederick Bland, an architect, noted that the essence of AMNH is its "excellent" architecture that has accrued on the site over time. He praised the design team's vision and level of detailing, adding that at this stage it can be dangerous to intrude on the details of another architects' design vocabulary. "Very seldom do you see a design this soaring and open," said commissioner Wellington Chen. "It's a stunning piece of architecture—the commission can be proud in approving the project," said Srinivasan. After hours of tension, a palpable wave of relief emanated from the assembled architects. After the LPC's vote, a smiling Jeanne Gang told AN that her team had to move the modeling and detailing much farther along than usual for this round of approvals. "We had to make the parametric model way ahead to figure out the coursing and interfaces with the masonry," she said. Next, the Gilder Center moves onto design development and through the Environmental Impact Statement (EIS) process towards an expected groundbreaking next year.